The designs for the 1946 Peace issue were prepared in 1943 by James Berry who designed many of the 1940 Centennial stamps. They were greatly admired and when Stanley Gibbons ran a competition to determine the 12 best stamp designs of 1945 and 1946, four of the stamps came from this issue, with the nine penny view of Franz Josef Glacier winning first prize. Large quantities of sheets of this issue were purchased by returning servicemen as investments, making this issue very easy to source, even today. 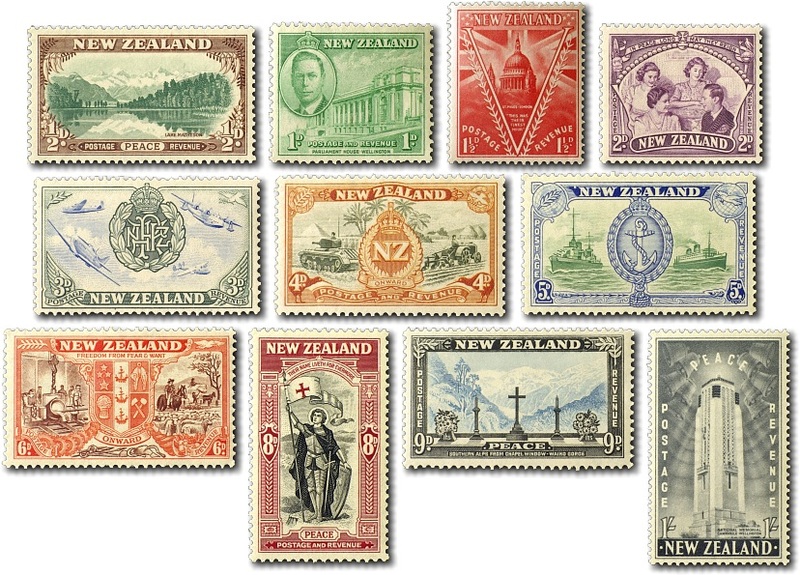 All stamps were recess printed except the 1½d and shilling stamps which were the first New Zealand stamps to be printed by photogravure. The halfpenny stamp features Lake Matheson with the Southern Alps in the background, including Mount Cook and part of the Fox Glacier. The penny stamp shows Parliament House in Wellington with a portrait of King George VI inset in an oval frame to the left. The 1½d stamp has Saint Paul's Cathedral in London superimposed over the Union Jack in the background with a large 'V' for victory and laurel sprays on each side. Below Saint Pauls is inscribed "This was their finest hour". James' original design featured a portrait of Winston Churchill in the place of Saint Pauls - this was the only stamp where the design had to be altered as at that stage, only the portraits of members of the royal family, or dead famous people could be included on stamps. The twopence stamp features the Royal Family - King George VI, Queen Elizabeth, Princess Elizabeth and Princess Margaret in a frame in the shape of the Royal Crown. At the top is inscribed "In Peace, long may they Reign"
The 3d stamp features the badge of the Royal New Zealand Air Force with the aircraft that New Zealanders flew alongside the RAF during the Battle of Britain to the left. To the right are civilian aircraft that the pilots will fly in peace with a white dove in the top right border. The four penny stamp is a similar tribute to the New Zealand Army, with a tank in Egypt replaced with a tractor on the farm. New Zealand forces played a prominent role in in Africa, Italy and the Pacific during the Second World War. The five penny stamp completes the trilogy with a tribute to the Royal New Zealand Navy with HMNZS Achilles in the war time role and the MV Dominion Monarch on the right. The Achilles, manned by New Zealanders, was one of three British naval vessels in the Battle of the River Plate in 1939 which tracked down and engaged the German pocket battleship 'Admiral Graf Spee'. The Graf Spee was damaged in the battle and docked for repairs in the neutral port of Montevideo, but was forced by international law to leave within 72 hours. Faced with what he believed to be overwhelming odds, the German captain scuttled his ship rather than risk the lives of his crew. Prior to the war, the Dominion Monarch was the largest ship in the Australasian trade and with a low passenger to crew ratio, offered exceptional luxury and service. During the Second World War she was stripped of her fittings and utilised as a troop transport eventually bringing New Zealand troops home after the war. She was refitted and returned to her former role after the war. The sixpence stamp features the New Zealand Coat of Arms with steel workers to the left and agriculture to the right and various tools and implements at the bottom under the inscription 'onward'. At the top of the stamp "freedom from fear and want". The 8d stamp features a knight holding a banner with the Cross of Saint George and the inscription 'their name liveth for evermore'. The image is taken from a stained glass window at the Wellington College Memorial Hall. The ninepence stamp features the view of the Franz Josef Glacier and Southern Alps from the Waiho Gorge Chapel window. The shilling stamp has the National Memorial Campanile, Wellington with heavenly bells ringing on either side. 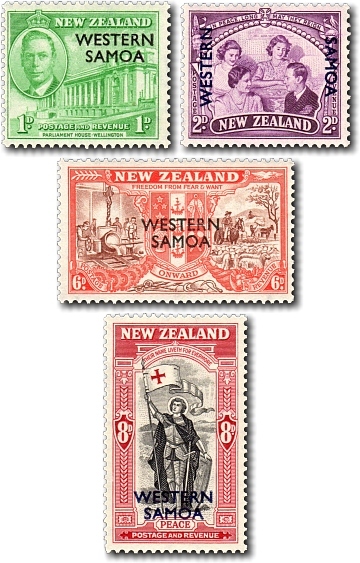 New Zealand postage stamps were often overprinted for use in other South Pacific countries such as Niue, the Cook Islands and Western Samoa, as shown above.